Sam Omik brings his snowmobile to a crawl. Driving slowly across the landfast sea ice that covers Eclipse Sound, he follows a gaping crack that reveals the ocean beneath. An Inuk from Pond Inlet, a far-flung hamlet on the northern edge of Baffin Island, Omik knows this type of ice; he’s been hunting on it since he was a child. Still, the crevasse — wide enough to swallow his snowmobile and the qamutik (sled) he’s pulling — has him worried. After all, his mission as the senior guide on tour company Arctic Kingdom’s narwhal and polar bear safari is to ensure the safe movement of 18 guests on their Nunavut holiday on ice. Searching for a narrow spot where the crack, or lead, can be bridged, Omik ignores the spectacle that plays out below. In the brine is an underwater version of the aurora borealis: glittery plankton dancing on rays of light and sun-splashed jellyfish with angel wings fluttering in slow-motion — strands in a web of life that, as Omik explains later, lives and livelihoods in the Arctic depend upon. 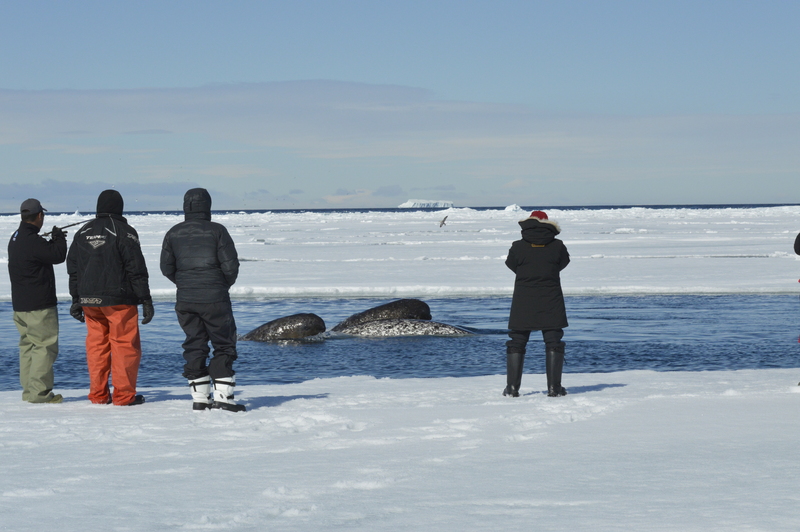 But Omik is taking guests to see the bigger picture — where plankton meets fish meets seal meets polar bear. An hour after crossing the lead, Omik orders the caravan of snowmobiles and sleds to a halt. He waves toward the sinaaq, the floe edge, where the landfast ice ends and the open ocean, studded with bobbing pack ice, begins. All eyes turn to the sinaaq and the mottled grey backs breaking the surface. All ears tune to the frequency of breathing narwhal. 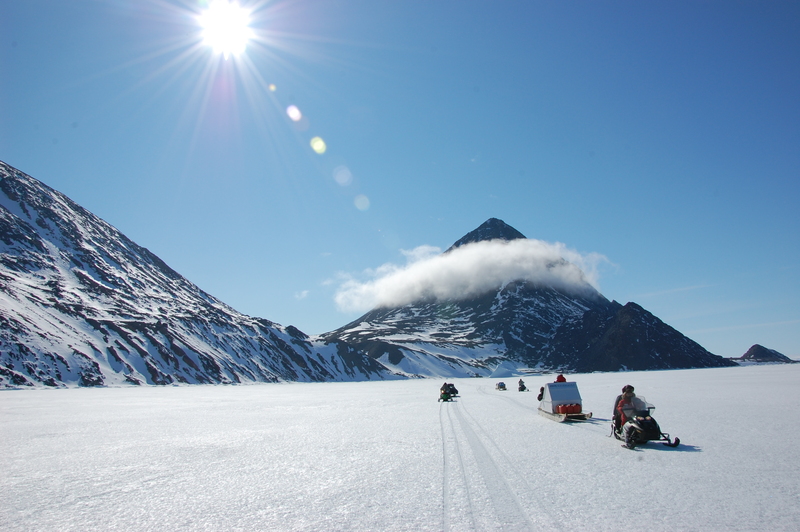 It’s no surprise that Arctic Kingdom, heeding the knowledge and skills of its Inuit guides, sets up its May-June safari base camp close to the sinaaq, in this case where Eclipse Sound meets Baffin Bay and the southeastern limit of the still-to-be-enshrined Tallurutiup Imanga (Lancaster Sound) National Marine Conservation Area. The springtime upwelling of ocean currents stirs up nutrients, while the never-setting sun acts as a giant particle accelerator, sending algae and phytoplankton into photosynthesizing overdrive. Hungry crustaceans move in, followed by squid, herring, Arctic cod and other invertebrates and fish. 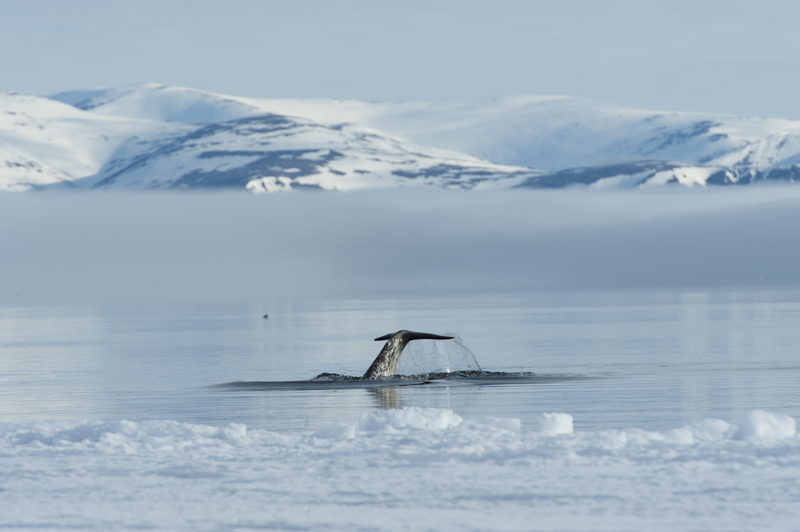 Served up just below the ice, this all-you-can-eat buffet is easily accessible from the open water at the floe edge, feeding thousands of migratory birds and scores of narwhal, beluga and bowhead whales who stop on their way to feeding and calving grounds farther north. Flying over Nunavut’s whitewashed barrens is akin to skimming a succession of panels in a graphic novel. Ridgetops, stripped of snow by the wind, pop like the dark outlines framing characters, and plotlines are etched by snowmobiles across the vast landscape. It’s minimal and maximal at the same time. Shift your gaze to ice level, though, and the close-up reveals its own contrasts and contradictions. Frozen seawater is resilient yet impermanent, powerful yet fragile. The mostly smooth landfast ice, unlike pack ice, is neither bullied nor carried by winds and currents. However, the 24-hour solar radiation melts its surface, forming rivulets that will eventually carve through the ice and create new leads. When such a crack reaches open water at both ends, huge pans break off and drift away, exposing a fresh floe edge closer to land. “That’s why our base camp is always two leads away from the sinaaq — no need to worry about floating away to Greenland,” says Françoise Gervais, a diver with a background in conservation and deep-sea research off Vancouver Island and Arctic Kingdom’s expedition leader. Karnasak adds that’s also why hunters will try to stay on the land-side of a lead, as a sort of insurance. The camp is set up pretty much the way Inuit have done for centuries, except here the ice is trip-wired; if it breaks off, an alarm sounds and the tents and yurts can be moved before the pan is lost to the pack ice. Alarms aside, this is a place that for the most part gives you the silent treatment — which is not to say it’s a void that needs to be filled with chatter. “A blabbering hunter is a hungry hunter,” guide Bryan Simonee says with a blunt laugh. The silence is a medium that carries important messages. Omik, for one, begins each morning by assessing the weather, including sounds, to determine if it’s safe to travel to the floe edge. He checks the wind speed and direction (offshore winds are preferred since they push pack ice out to sea, leaving the floe edge undisturbed) and cloud formations to forecast precipitation or storms. Sometimes the conditions warrant a physical inspection of the ice, and he disappears on his snowmobile. After one such reconnaissance run, he comes back telling guests he heard creaking noises at the sinaaq. “The ice told me we need to wait, so we wait,” he says, explaining that it could shift and leave the group stranded an hour away from camp. A couple of hours later, the floe edge stops talking. The caravan sets out behind Omik. In the distance, a wall of jagged peaks rises from the horizon; it’s the pack ice, chainsawed by the wind into ice sculptures. But the feel of the ice doesn’t conform with the pretty image. It has changed since the previous night, the qamutiks bouncing hard over frozen ridges, bracing left, leaping right. Simonee explains that the slats on the qamutik are tied with rope to the runners. “That way, they flex like the rib cage on a walrus when it moves on land,” he says. It was a much more forceful movement that shook Scott Johnson in his tent early that morning. 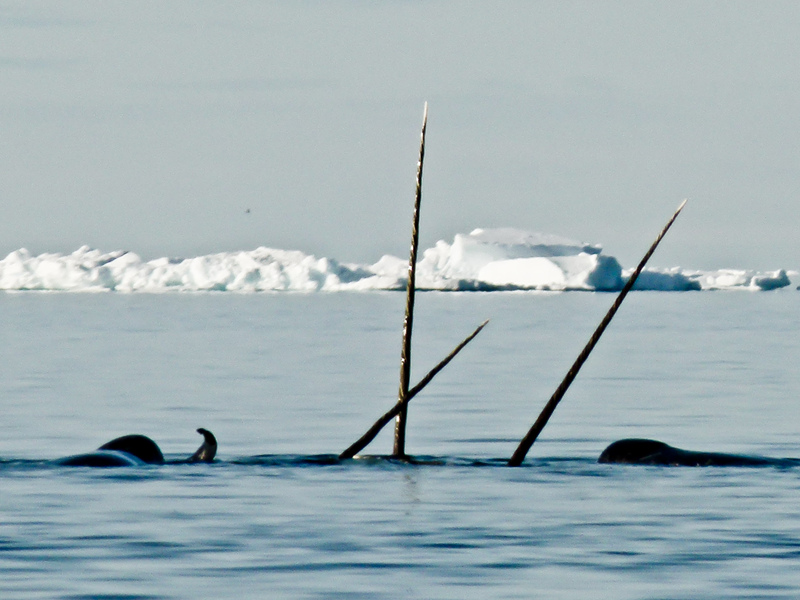 He’s on the floe edge with a crew producing a film on how to prepare for a narwhal hunt; it will be used by Nunavut Arctic College to transmit hunting skills to youth who don’t have a father or uncle to do that job. Nunavut’s regional wildlife manager for north Baffin, Johnson tells Omik and the other guides what happened. “We were sleeping when a windstorm pushed the pan of ice so hard that all of a sudden it started breaking apart. We had to rush to get onto solid ice.” No one was hurt, but the ocean swallowed two tents, a snowmobile, a qamutik and lots of gear. So much for the silent treatment. The nest cliffs on the east end of Bylot Island, a mere wing flap northeast of Arctic Kingdom’s base camp, usually affords its feathered summer residents vistas of ice floes and bergs slowly drifting south in Baffin Bay. But on days when the air is warmer than the ice beneath it, the black-legged kittiwakes and thick-billed murres might be seeing visions of turreted castles, petrified forests and behemoth cruise ships instead, not knowing that the floating objects are not what they seem. They are mirages, icebergs from the Greenland Ice Sheet stretched skyward by an optical illusion that transforms natural features into magical monuments. Not all illusions in the Arctic are magical. The image of this remote region as pristine and untouched by human hands is an example of what people want to see. Gervais was drawn to the Arctic for its freedom from widespread human intervention. “The landscape here has barely been modified; it’s intact in a way you don’t see in many other places,” she says. It’s true there’s little to no visible scarring, such as highways and other paved-over paradises. But microplastics have entered the biome and increased ship traffic and seismic testing interfere with whales’ echolocation. Zoom out further and human influence in the shape of climate change affects even the remote floe edge. Taking in vast expanses of ice, glaciers and snow-capped peaks, the once-in-a-lifetime visitor may not notice that this seemingly immutable landscape is changing. But for the people of Pond Inlet, the changes are tangible. 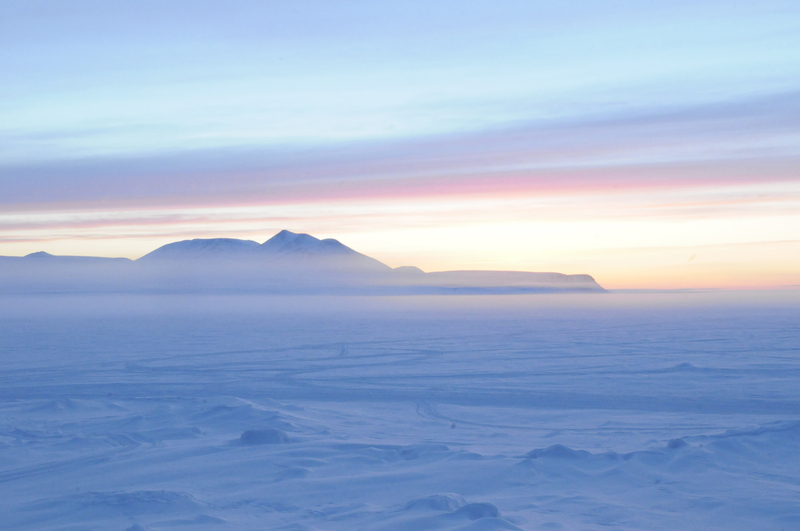 Sitting on his snowmobile at the sinaaq, Omik scans the horizon, past the pack ice. “You learn about the ice by going out on the ice,” he says of the lifetime it takes to know how to read the conditions in a way that enables the safest possible travel. “You keep track of it from day to day, looking for cracks, how big they are, if they’ve widened since the last time you passed,” he says. This routine is repeated over each season and from year to year. Assessing risk is difficult when the ice doesn’t behave the way it used to. More freak warm-weather events in winter create slushy ice; higher air temperatures produce more meltwater on top of the landfast ice, concealing cracks. “We didn’t use to get the windstorms we had the other night, at least not at this time of year,” Omik says, referring to gusts so powerful they pulled two base camp yurts from their moorings and ripped a third one apart completely, leaving its mangled structure and the occupants’ contents strewn across a swath of waterlogged ice. “The ice is also thinner now, and it forms later and breaks up earlier than before,” says Omik. The consequences are a shorter hunting season. The ability to find food in the Anthropocene has also become a challenge for the animals at or close to the floe edge. Consider the polar bear, an animal that Andrew Derocher, a biological sciences professor at the University of Alberta, has researched for more than three decades. “For these bears, the loss of sea ice means habitat loss. They depend on the ice for hunting and now have a shorter time frame for fattening up,” he says. While the bear population around Baffin Bay — one of 19 subpopulations across the Arctic — is still showing healthy numbers, Derocher believes that will change over the next few decades if global temperatures keep rising. For now, though, sea-ice cover in their habitat — and that of the ringed seals they prefer to eat — hasn’t decreased as dramatically as in other Arctic regions. That’s good news for floe-edge visitors who’ve travelled far for the chance to see one. Omik and the other guides are constantly on the lookout for polar bears, as are the guests, scanning the horizon using binoculars, spotting scopes and telephoto lenses. One afternoon as wetsuits and flippers are donned and water is boiled for tea, two guests turn their backs on the group. Staring at the distant Baffin shore, they don’t know what to look for, but they do know what they want to see. Just as they’re about to give up and rejoin the party, they catch sight of something. A blob. A blur. White and red. “It’s moving!” they hiss. Mugs are tossed and binoculars raised. Everyone devours the view of the largest land-based predator on Earth and high-fives its success at snatching a seal out of its breathing hole. The polar bear drags its lunch to the side and starts eating. Sam Omik died of a heart attack on Dec. 30, 2018, after reporting for this story was completed. He was 66 and had worked for Arctic Kingdom for a decade. —Ed. Susan Nerberg writes about science, the environment and travel. Her work has appeared in Azure, the Globe and Mail and Report on Business Magazine, among others.